Probably the only place to listen to some good jazz in Toronto and will probably make our top 10 list. With top musicians, just dropping in for jams every now and again, you’re assured some good listening. In honour of their moto ” More great jazz than anywhere else, all the time”…here’s list of who’s played here, Kurt Elling, Randy Brecker, Wynton Marsalis & Lincoln Center Orchestra, Chris Potter, Roy Hargrove’s RH Factor, Joshua Redman, Russel Malone, Harry Connick Jr., George Garzone, Frank Tiberi, David Binney, Mark Turner, The Bloomdaddies, Ari Hoenig’s Punk Bop, Willem Breuker Kollektiv, Ricardo Del Fra, Derek Trucks Band, Mulgrew Miller, Eric Reed, Stacy Rowles, Ani Difranco, Maceo Parker, Dave Liebman, Seamus Blake, Chris Tarry, Henry Hey, Pete McCann, Chris Cheek, Tim LeFebvre, Keith Carlock, Gary Versace, Dan Weiss, Slide Hampton, Joe & Pat LaBarbera, Christian Scott, Rob McConnell, Donny McCaslin, Ben Monder, Scott Colley, Antonio Sanchez, Don Byron and many more. 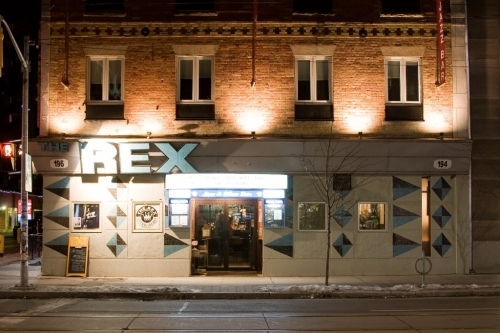 The vibe is superb and so is the hip Queen Street location. The club has been drawing crowds since it’s opening in 1951 and is still owned by the same owner. Rest assured you’ll be taken care of in this lovely corner watering hole.